© 2002, © 2018 by Paul Freeman. Revised 3/2/18. 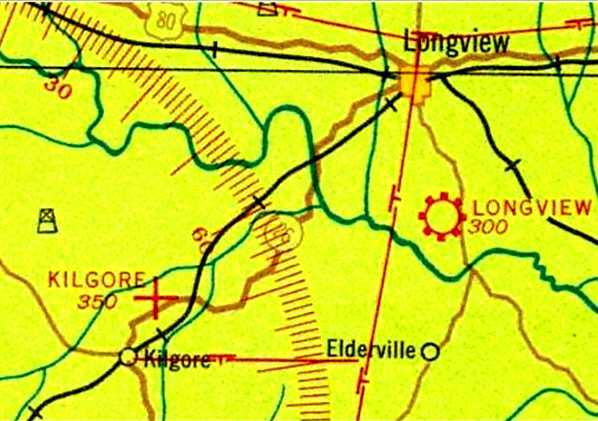 Lone Star Airfield, as depicted on the 1962 USGS topo map. as it was not yet depicted on the 1942 Shreveport Sectional Chart. 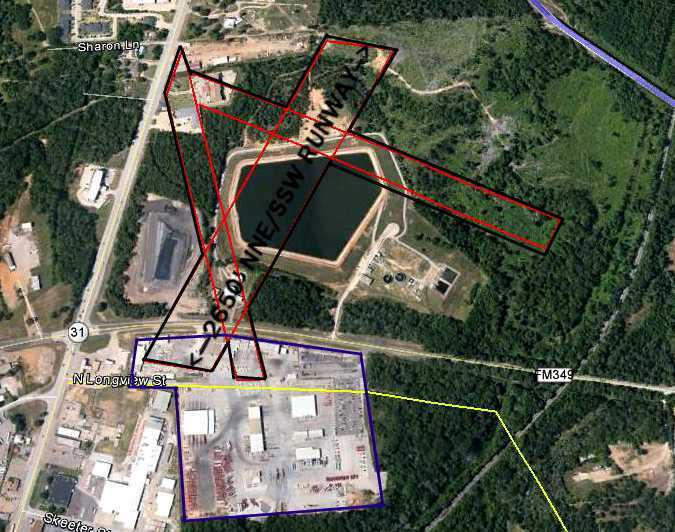 The Lone Star Steel Airport was evidently built to support the Lone Star Steel mill, adjacent to the southeast. The earliest depiction which has been located of Lone Star Steel Airport was on the 1962 USGS topo map. 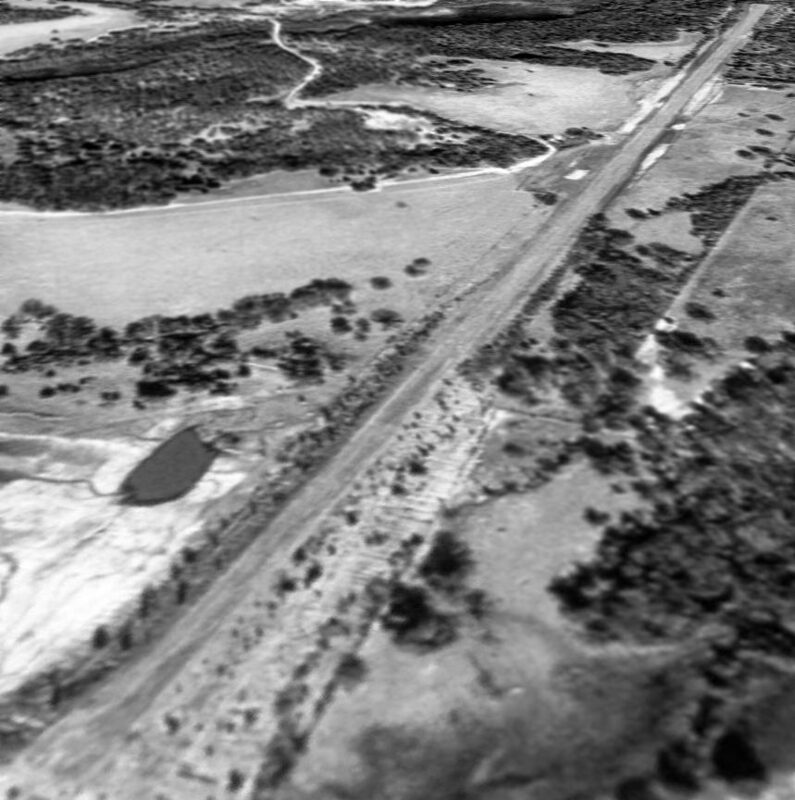 It depicted “Lone Star Airfield” as having 2 paved runways, with a single small building to the northwest of the runway intersection. According to former Fort Worth Center controller David Benedetto, “Lone Star Steel Airport even had a private IFR approach. 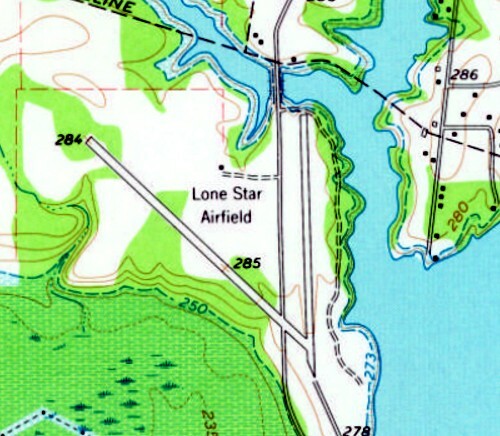 The 1984 USGS topo map depicted Lone Star Steel Airport as 2 runways, labeled simply as “Landing Strips”. 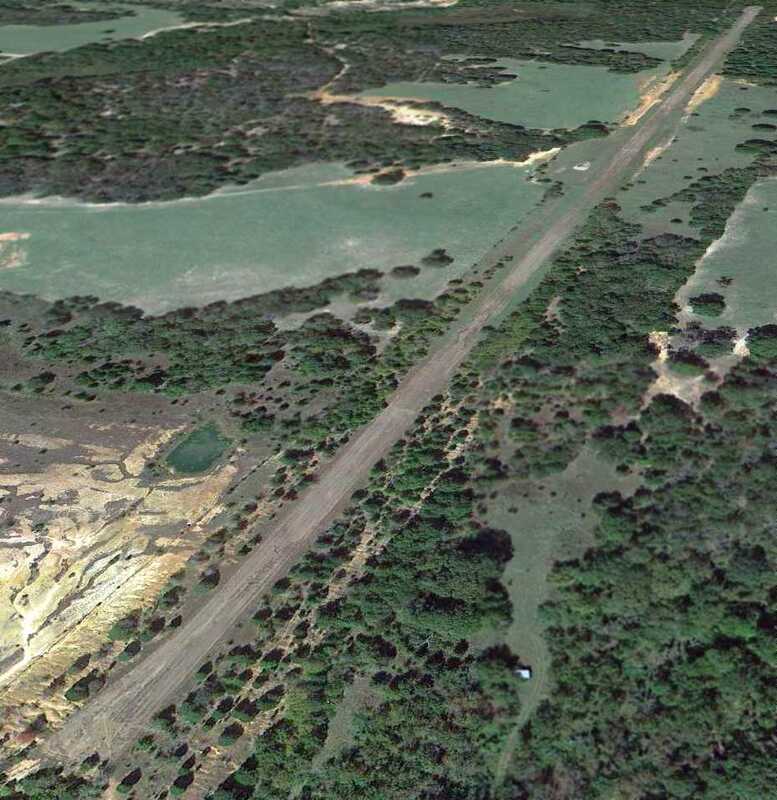 The earliest photo which has been located of Lone Star Steel Airport was a 1995 USGS aerial view looking north. It showed Lone Star Steel to have a paved northwest/southeast airport, and a grass north/south runway. A single small hangar sat at the southeast end. Tommy Hudson recalled, “I flew a Cessna 310 into Lone Star Airport during the late 1990s for business meetings with Lone Star Steel. I can confirm the existence of a Non-Directional Beacon instrument approach which I used to assist our landing in bad weather. As I recall, the approach was from the West. When an inbound flight was anticipated a security guard would respond to a radio call on the Unicom frequency. When the flight came into view nearing the runway the guard would lower crossings to block traffic on the county road to allow the landing aircraft full runway length. The date of closure of Lone Star Steel Airport has not been determined, but a 2015 aerial view looking north shows the paved runway marked with closed-runway “X” symbols. 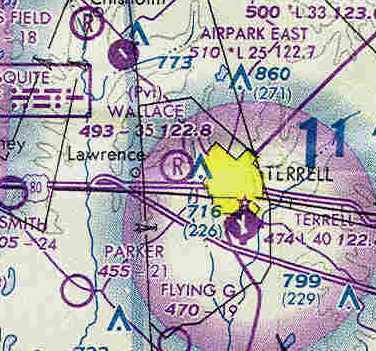 As of 2017, sectional charts depict Lone Star Steel Airport as an abandoned airfield. Lone Star Steel Airport is located north of Airstrip Road, appropriately enough. Thanks to David Benedetto for pointing out this airfield. A 10/17/43 aerial view looking north at Stewart Airport from the 1945 AAF Airfield Directory (courtesy of Scott Murdock). 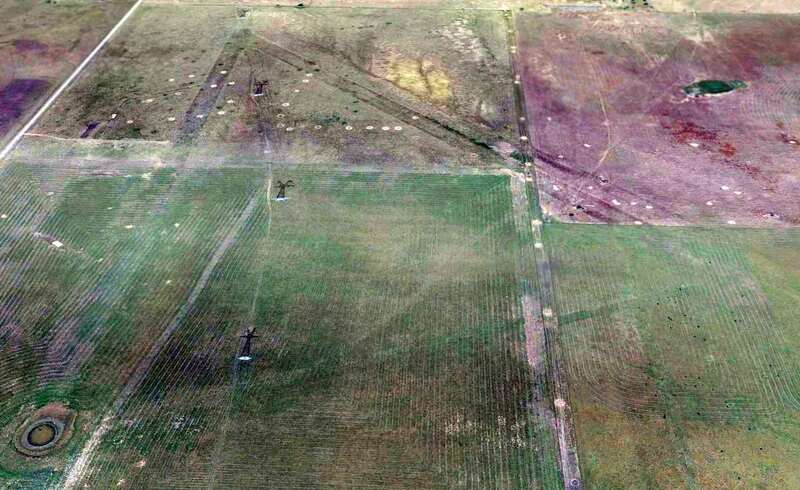 It depicted “Elders Field” as having 3 unpaved runways. The earliest depiction which has been located of Stewart Airport was a 10/17/43 aerial view looking north from the 1945 AAF Airfield Directory (courtesy of Scott Murdock). The directory described Stewart Airport as a 113 acre irregularly-shaped property having 2 sand & sod runways, measuring 2,500' north/south & 1,900' east/west. The field was said to have 2 hangars, the largest measuring 120' x 80', and to be owned & operated by private interests. but I don’t think that they ever got off the ground. Someone gave a program on it at our historical society. The plant building was on the north side of Erwin Street & the east side of the loop. with 4 light single-engine aircraft visible near the buildings on the northwest corner. 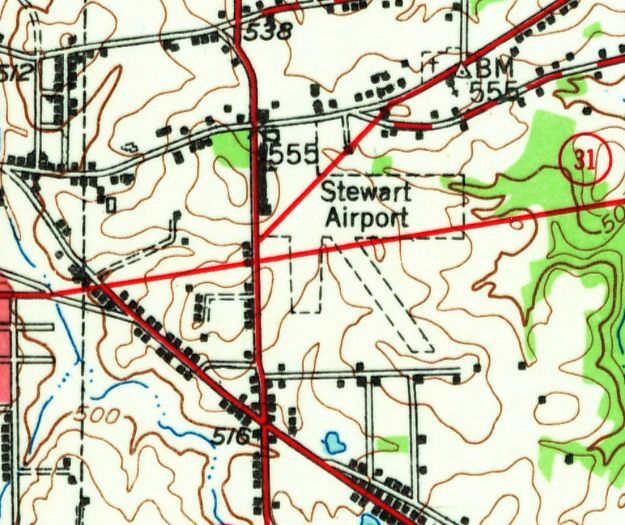 The 1948 USGS topo map depicted Stewart Airport as having 3 unpaved runways, with a long building along the road on the west side. but several hangars & airport buildings remained standing on the northwest portion of the airport site. 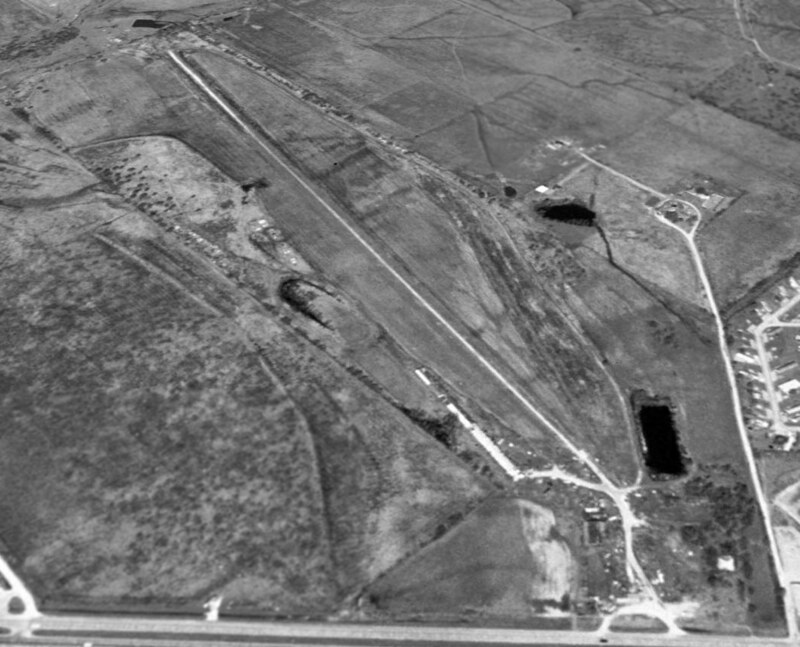 A 2015 aerial view showed no recognizable trace remaining of Stewart Airport. 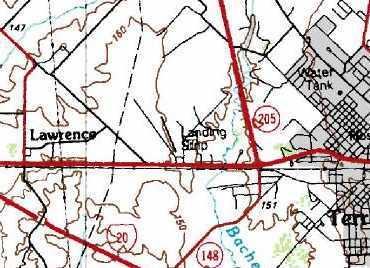 The site of Stewart Airport is located southeast of the intersection of East Erwin Street & 323 Loop. 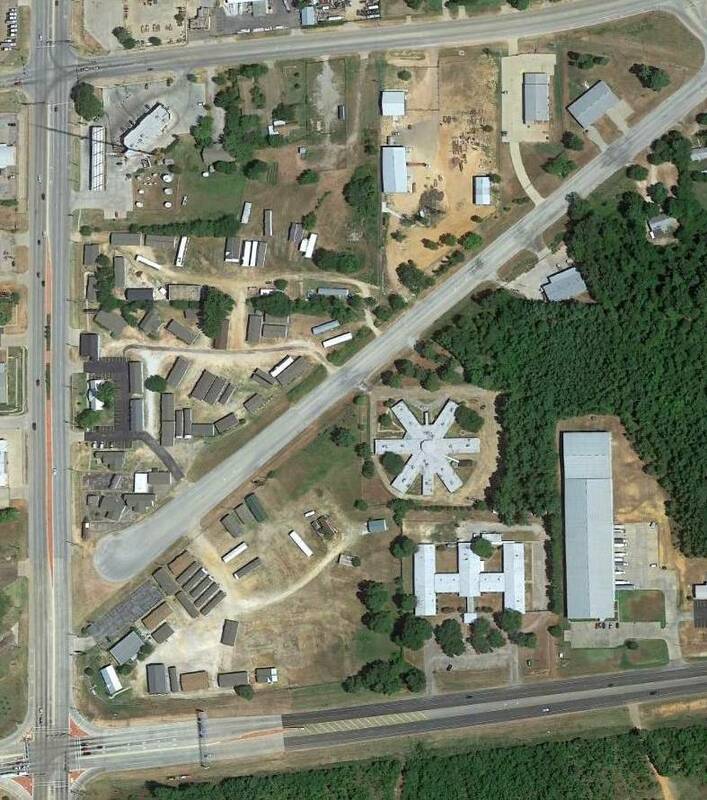 Thanks to Randy Gilbert for pointing out this airfield. 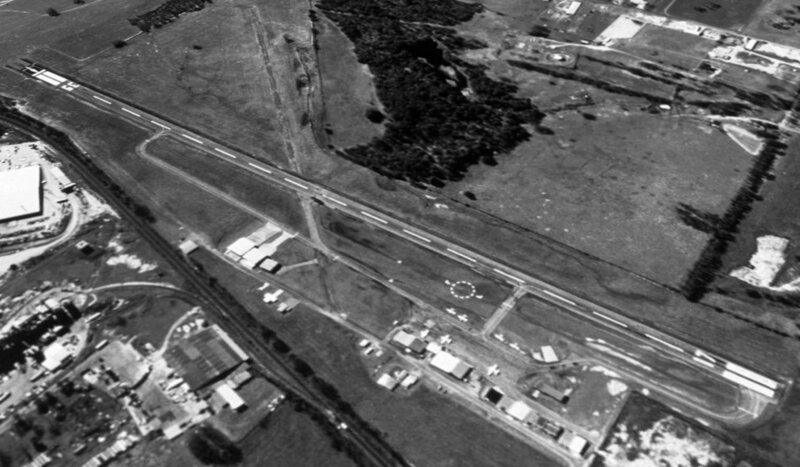 Athens Airfield, as depicted on an 11/13/82 aerial view. 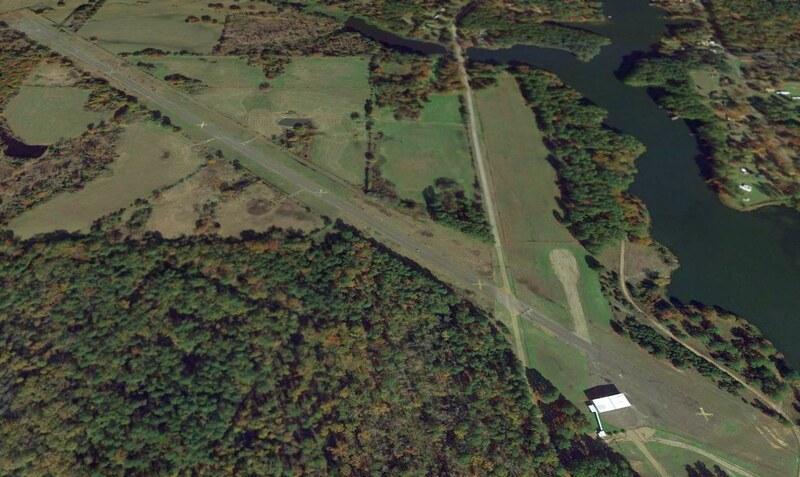 Not much is known about this apparent private airfield located due south of the town of Athens, including its date of construction, name, or purpose. 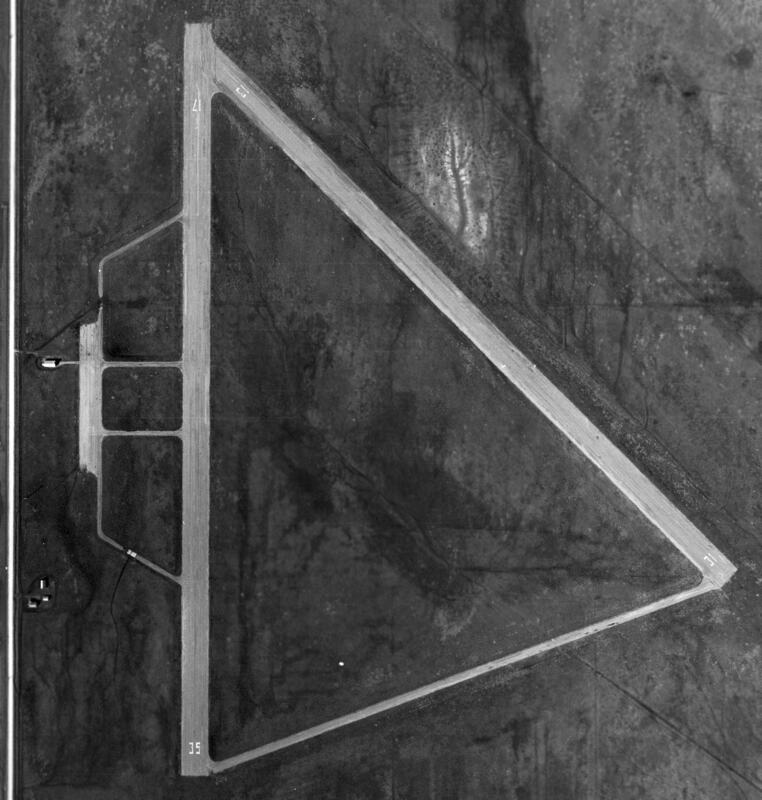 which depicted a single 5,000' asphalt north/south runway. 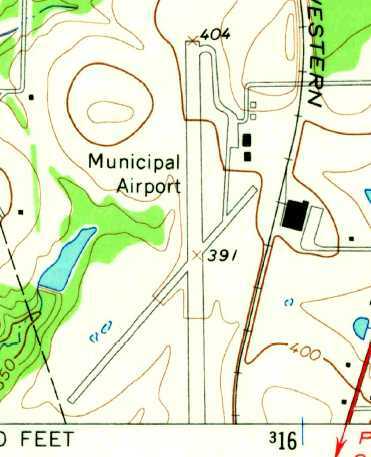 The 1984 USGS topo map depicted a single north/south runway at Athens, labeled simply as “Landing Strip”. A 2/2/95 USGS aerial view looking northwest at the Athens Airfield. A 10/17/12 aerial view looking northwest showed the Athens runway as remaining intact though considerably deteriorated. As of 2014 no airfield was listed with the FAA at the location of the Athens Airfield. The site of Athens Airfield is located west of the intersection of Stonebridge & Route 753. 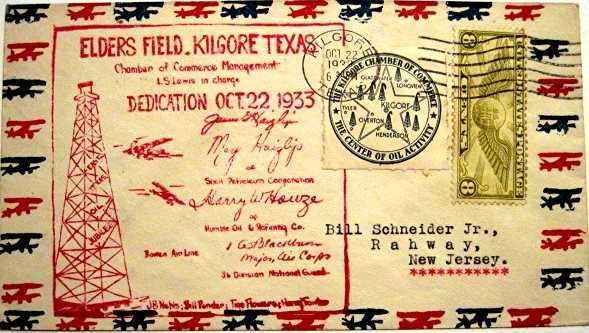 A postmark commemorating the 10/22/33 dedication of “Elders Field” (courtesy of Greg Patterson). according to a commemorative postmark (courtesy of Greg Patterson). was on the 1934 Shreveport Sectional Chart (courtesy of Greg Patterson). 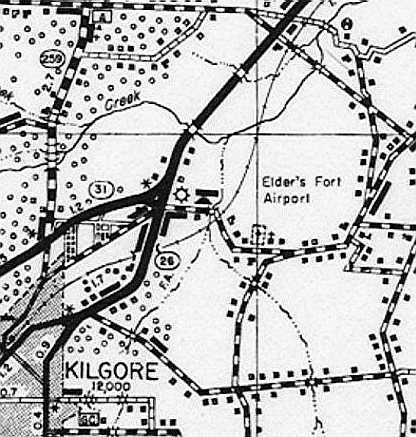 It depicted “Kilgore” as an auxiliary airfield. as an open area with buildings along the southern periphery. 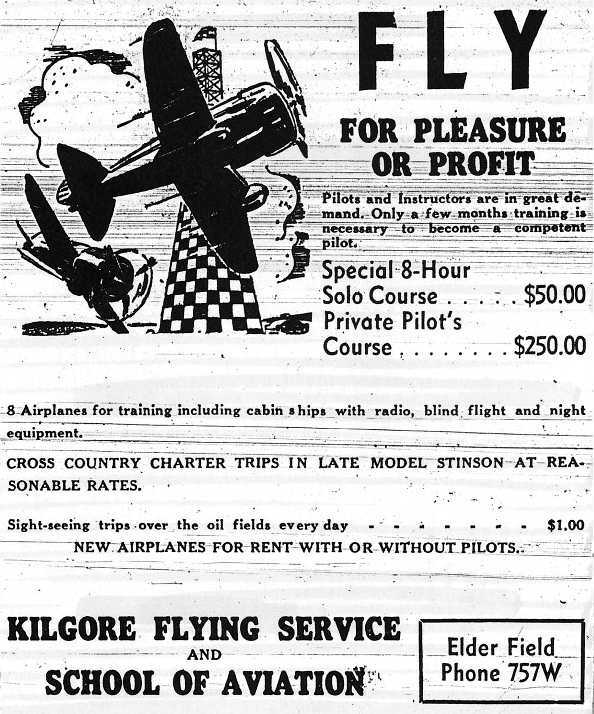 A 5/18/41 advertisement (courtesy of Greg Patterson) for Kilgore Flying Service & School of Aviation. in front of a Waco biplane trainer at Elder Field. Greg Patterson recalled, “My father H. E. Patterson was a Civilian Pilot Training Program instructor at Elder Field from 1942-44. 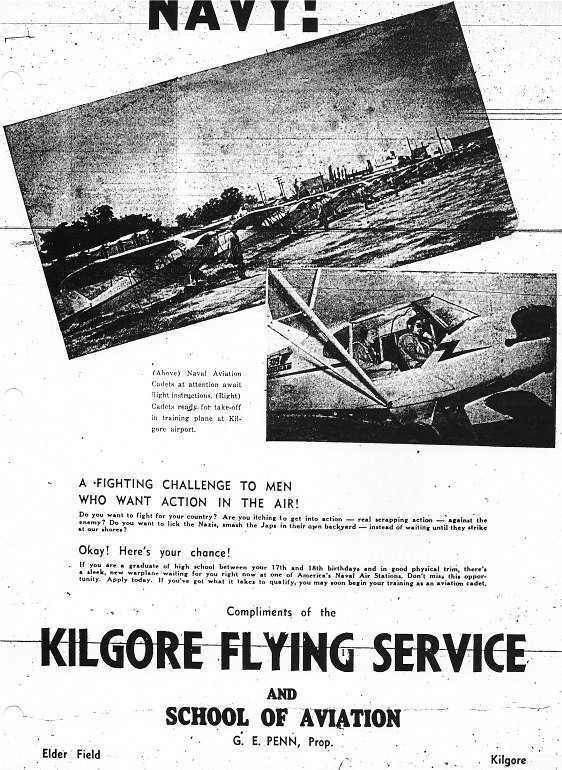 A 5/23/43 advertisement (courtesy of Greg Patterson) for Kilgore Flying Service & School of Aviation. An undated photo of a line of Piper Cubs from a 5/23/43 advertisement (courtesy of Greg Patterson) for Kilgore Flying Service & School of Aviation. was a 10/17/43 aerial view looking north from the 1945 AAF Airfield Directory (courtesy of Scott Murdock). was on the 1943 Sectional Chart (courtesy of Greg Patterson). 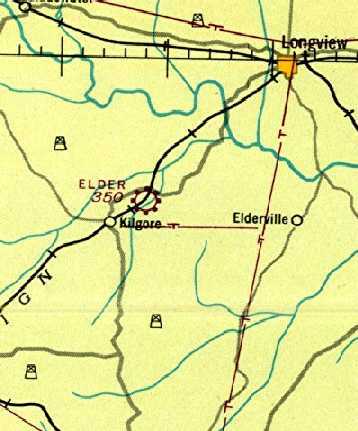 It depicted Elder as a commercial/municipal airport. as a 200 acre L-shaped property having 3 sod & dirt runways, the longest measuring 2,650' NNE/SSW. According to Greg Patterson, “Elder Field's Fixed Base Operator G. E. Penn moved his operation to the New Gregg County Airport when it opened on 7/14/47. Donald Martin recalled, “Elder Field... I worked there as a teen-age operations assistant in the summers of 1952, 1953, and 1954 & earned my Private License in payment. The field was managed by Don Malarkey & his wife Vera. They were professional golfers & were away a great deal of the time leaving me as the sole operator. operating the office, and running the golf driving range located at the south end of the field. We operated a Piper Cruiser, a Taylorcraft, 2 J-3 Cubs, a Cessna 120 & 140, and a Stinson Voyager. My first logbook entry was 6/10/52 in Piper 2414M & my last was 12/16/54 in the same airplane. 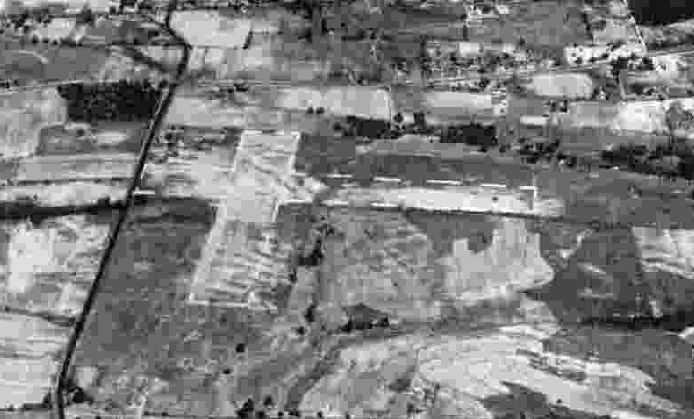 A 1970 aerial photo showed the remains of a northeast/southwest runway at the site of Elder Field. Greg Patterson recalled, “My dad often pointed out the location of the field. 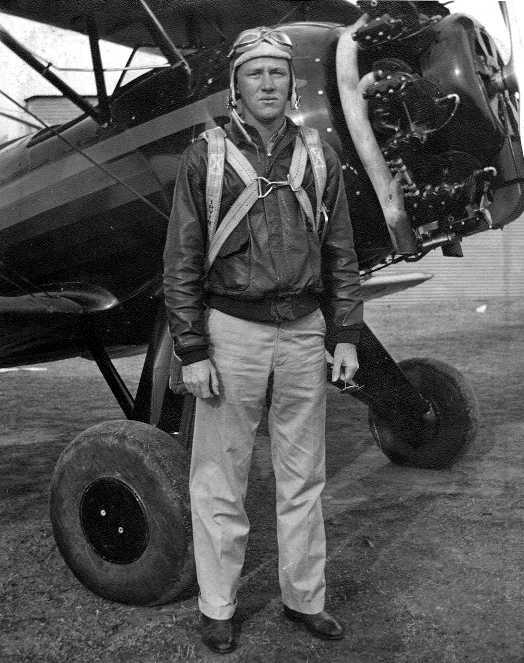 Greg Patterson recalled, “Into the 1980s the tree my dad pointed out, as the tree student pilot Menasco crashed a Waco trainer into in 1941, was still standing. The 1995 USGS aerial photo shows that a large retaining pond of some type occupied the majority of the airport property. A 4/22/12 aerial annotated by Shayne Rogers to show the location of the Edler runways. It does not appear to show any remaining trace of Elder Field. Shayne observed, “FM 349 was not there in 1933- 1940s, it couldn't have been. 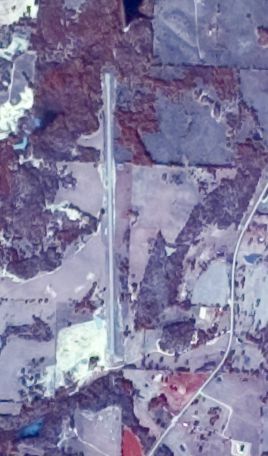 Highway 259 (north & south) is still right to the west of the former airfield & it lines up with the 1943 aerial picture. 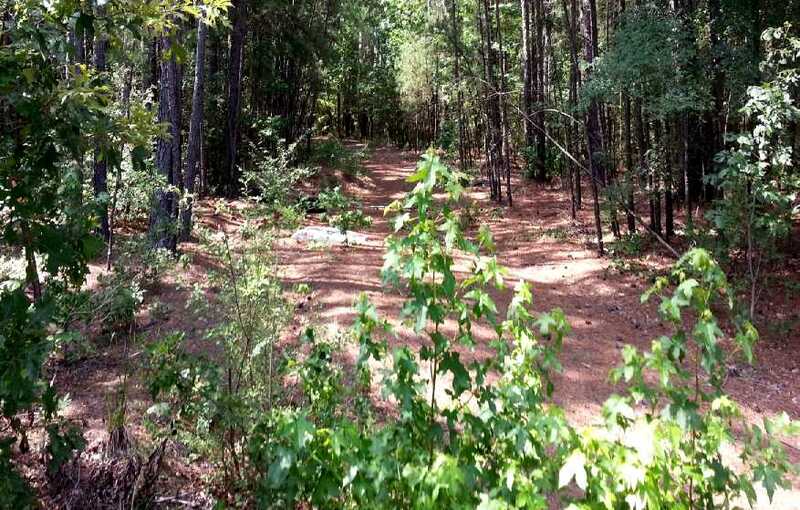 I have determined that the west entrance to Halliburton, off Highway 259- is that old road. A 6/21/13 photo by Shayne Rogers looking southwest along the northwest/southeast runway. A 6/21/13 photo by Shayne Rogers of 2 Goodyear aircraft tires at the site of Elder Field. 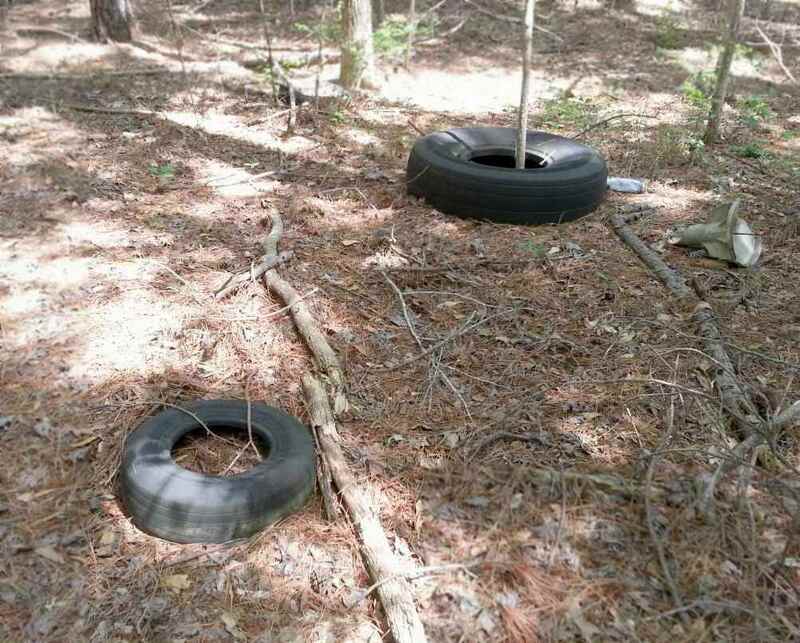 Shayne observed, “I was walking the woods & stumbled on 3 aircraft tires...who'd a thunk it? The site of Elder Field is located northeast of the intersection of Route 31 & Route 259. 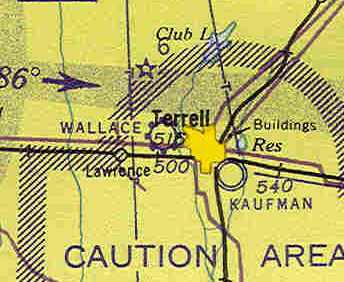 Wallace Airfield, as depicted on the February 1943 Dallas Sectional Chart (courtesy of Chris Kennedy). The date of establishment of this small general aviation field has not been determined. No airfield at this location was depicted on the September 1942 Dallas Sectional Chart (according to Chris Kennedy). Barbara Wallace Simandl reported, “I am the granddaughter of one of the prior owners of the Wallace airport. The information I have heard is that my father, James Wallace, and one or two of his brothers ran this airport. was on the February 1943 Dallas Sectional Chart (courtesy of Chris Kennedy). It depicted Wallace as a commercial/municipal field. was a 10/21/43 aerial view looking north from the 1945 AAF Airfield Directory (courtesy of Scott Murdock). It depicted Wallace as having an unpaved runway. as a 98 acre irregularly-shaped property within which was a 1,850' sod runway within a 2,100' x 1,200' sod all-way landing area. as having a single unpaved northwest/southeast runway. 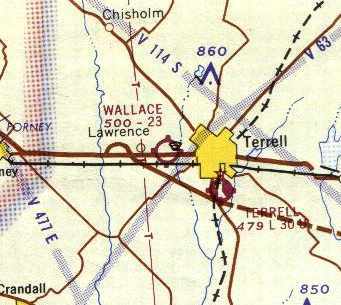 The 1965 DFW Sectional Chart described Wallace Airfield as having a single 2,365' turf runway. John Criswell recalled, “It had a short strip with a few T-hangars on the Northeast side. which cut across the threshold of the runway. I got my ticket in 1965 at Dallas Redbird and remember one of my solo flights included a quick stop at Terrell. The last time I was there, now many years ago, there was still a Stinson Voyager on the field, but not much else. depicted Wallace Airfield as consisting of a single 2,365' turf Runway 15/33. The manager was listed as Matthew Wallace. The airfield configuration was unchanged in the 1970 TX Airport Directory (courtesy of Ray Brindle). with a 3,500' unpaved runway. as that is how it was depicted on the July 1985 Dallas-Ft Worth Sectional Chart (courtesy of Chris Kennedy). but it was labeled simply as “Landing Strip”, which may have indicated that the field had closed by that point. as it was no longer depicted at all on the July 1987 CG-20 World Aeronautical Chart (according to Chris Kennedy). but the site was otherwise unrecognizable as a former airport. A Spring 2004 photo by Joe Hancock, looking north from Route 80 at the former Wallace hangar. Joe observed, “I assume this old rusty hangar is about all that's left of it. The old hangar used to have a sign reading 'Wallace Airfield, Matthew Wallace owner'. 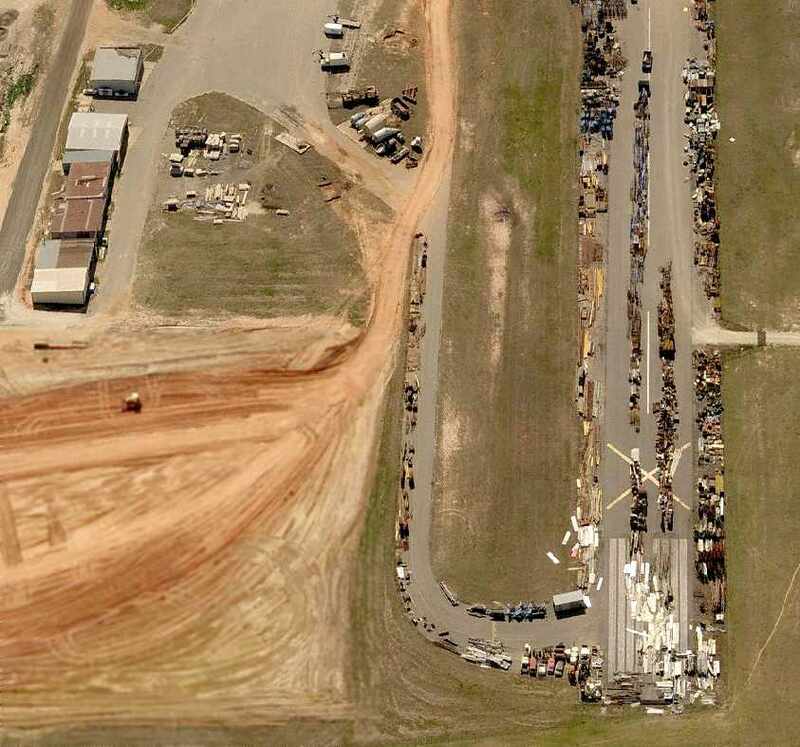 A circa 2006 aerial photo still showed the hangar standing. 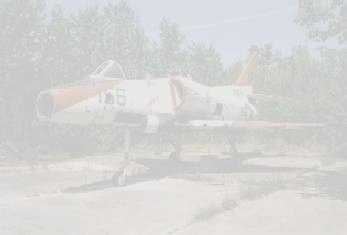 However, a circa 2006-08 photo showed that the hangar had been removed. The runway area still remained clear. 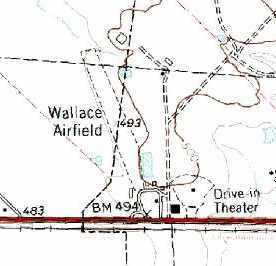 The site of Wallace Airfield is located northeast of the intersection of Route 80 & Route 237. Mount Pleasant Municipal Airport, as depicted in the 1963 TX Airport Directory (courtesy of Steve Cruse). as it was not yet listed among active airfields in the 1945 AAF Airfield Directory (courtesy of Scott Murdock) . as that is how it was labeled on the 1949 Shreveport Sectional Chart (according to Chris Kennedy). as that is how it was listed in the 1962 AOPA Airport Directory. and the operator was listed as the William Phinney Flying Service. a 3,800' asphalt Runway 17/35 & a 2,600' oiled Runway 3/21. An apron sat on the northeast corner of the field, with several small hangars. The manager was listed as William Pinney, of the William Phinney Flying Service. 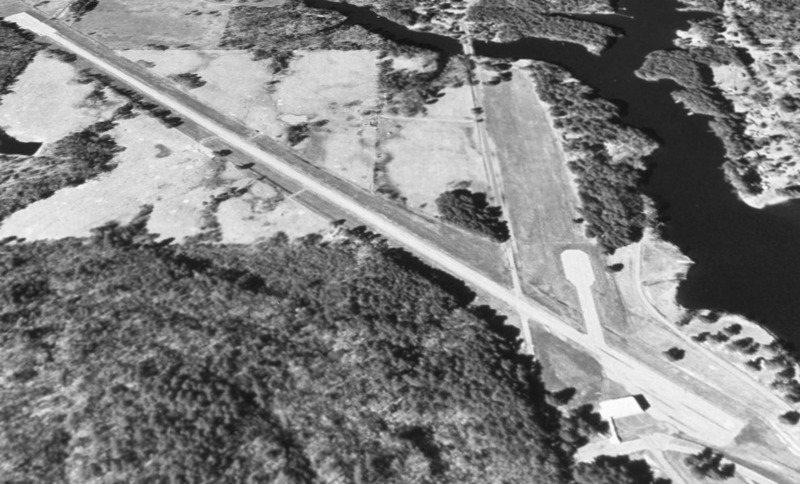 The earliest photo which has been located of Mount Pleasant Municipal Airport was a 1964 aerial view. 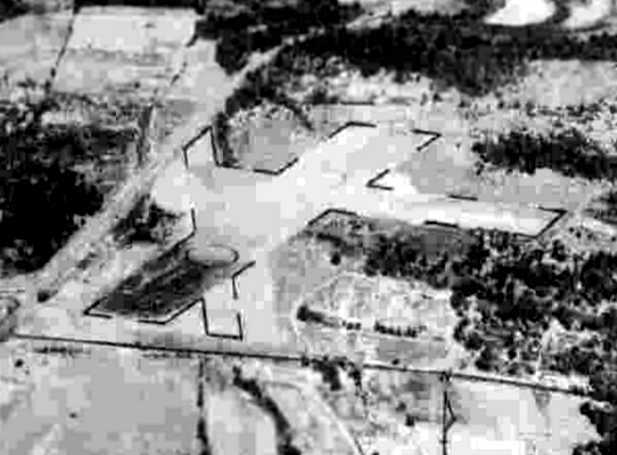 It depicted the field as having 2 asphalt runways, with 4 small hangars on the northeast side. 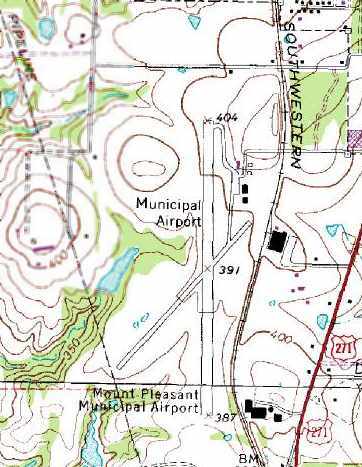 The 1965 USGS topo map depicted Mount Pleasant Municipal Airport as having 2 paved runways, with 4 small hangars on the northeast side. but the manager was listed as Harrold Huneycutt. with a ramp with several hangars on the northeast side of the field. but the manager was listed as J.D. Roper. A 1995 USGS aerial view looking at Mt Pleasant Airport while it was still open. when it was replaced by a newly-built Mount Pleasant Municipal Airport to the east. and he told me that the old airport was sold to a private party for commercial development. Unfortunately… there was a stipulation in the sale that disallows any aviation activity at the old airfield." 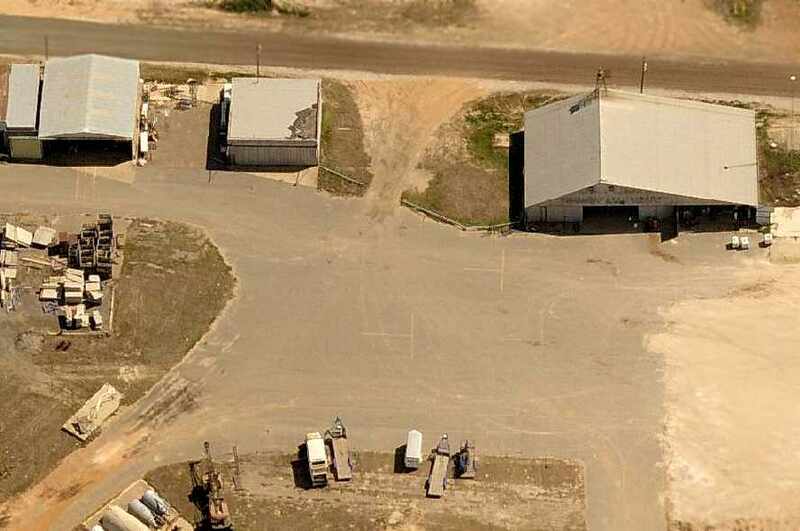 A circa 2006 aerial view looking east at the hangars which remain standing at the site of the original Mt Pleasant Municipal Airport. now used for storage of a large number of vehicles & other unidentified items. 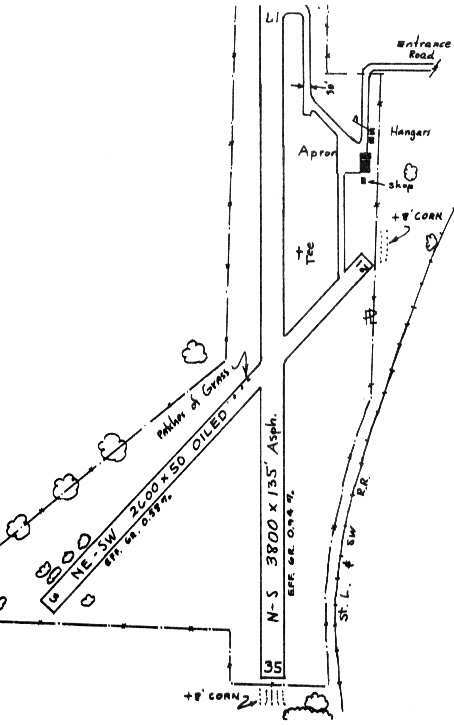 Gaskin Field, as depicted on the March 1944 Dallas Sectional Chart. Gaskin Field was not yet depicted on the February 1943 Dallas Sectional Chart. which depicted it as an auxiliary airfield. 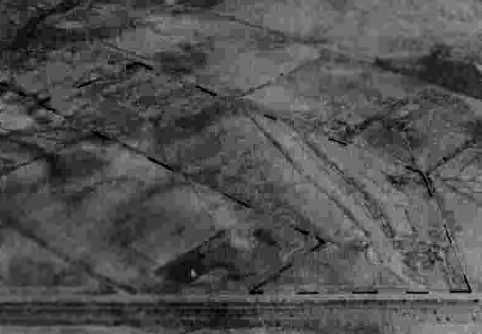 This 594 acre field was built during WW2 as one of 5 satellite fields for Perrin AAF (16 miles northeast), which conducted basic flight training. but was reportedly reactivated from 1948-1952 as Gaskin Air Force Auxiliary Field. 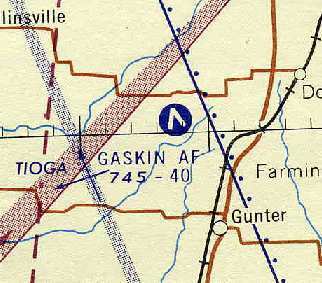 It was labeled “Gaskin AF Aux” on a 1954 Army Map Service topo map (courtesy of Bob Morris). 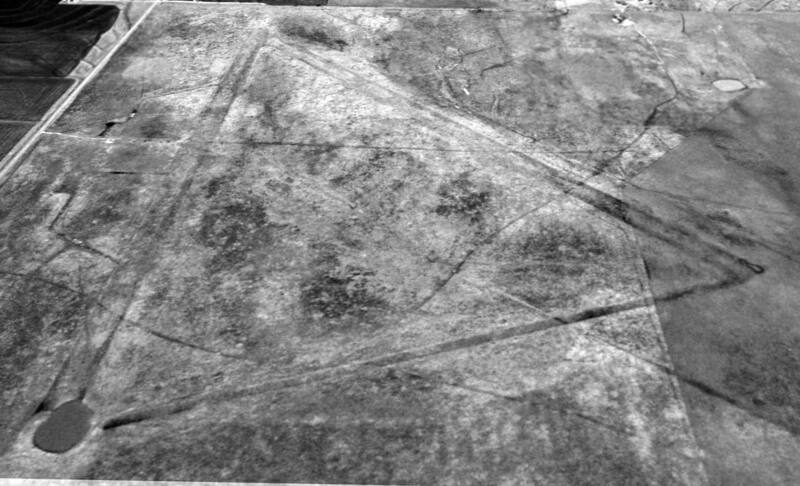 The earliest photo which has been located of Gaskin Field was a 2/23/55 USGS aerial view (courtesy of Bob Morris). Both runways (17/35 & 13/31) were painted with runway numbers as active runways. 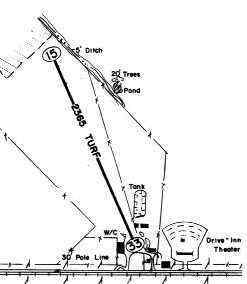 Bob Morris observed, “Gaskin had 2 runways: 17/35 (north/south) & 13/31 (northwest/southeast), and taxiway between the south end of Runway 17/35 & the southeast end of Runway 13/31. There were 4 taxiways on the west of Runway 17/35 that led to a small parking apron, and an apparently administration / field operations building with a red & white checkered roof. The shadow of the operations building appears to indicate it had an elevated structure, possibly a control tower, on its east end. can be seen the rotating beacon & its shadow (which is actually more conspicuous than the tower) extending to the northeast. Due south of the rotating beacon is a cluster of 3 buildings which also appear to have the standard red & white checkered roofs. Whether these buildings were involved with the operation of the field, or whether their roofs were painted merely for visibility/safety/identification, is not known. I am of the opinion that the runways, taxiways & apron were not paved with concrete or asphalt. This is based on the fact that they are of a light color on the aerial photo. The only paved runways that appear light on aerial photos are concrete, and if they were made of concrete they would be readily visible, even today. 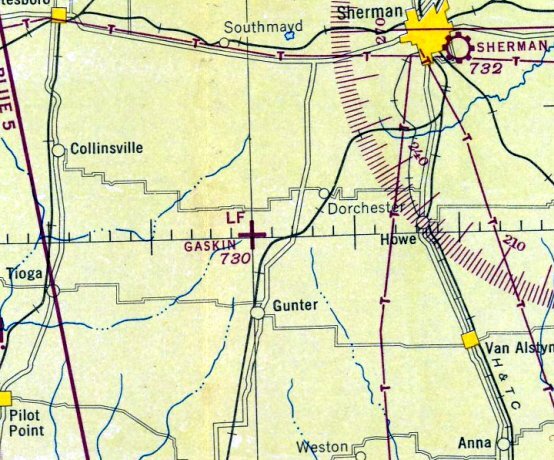 The north/south road immediately west of the field is shown on the 1940 Grayson County Highway Map as a gravel surfaced road. so it is not clear if it was indeed still open in 1957. The chart described the field as having 2 paved runways, with the longest being 4,000'. 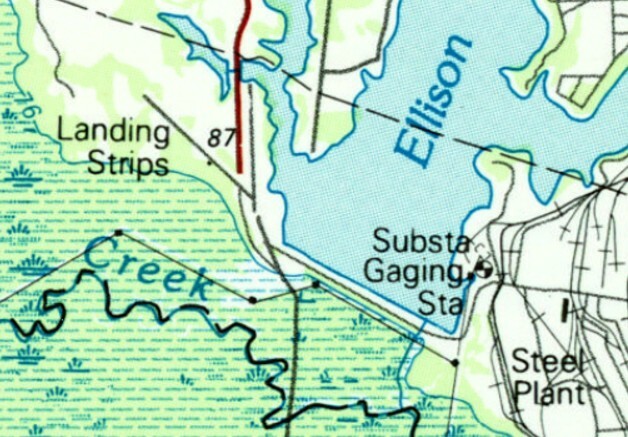 Gaskin Field was no longer depicted at all on the 1958 USGS topo map. on the 1960 Dallas Sectional Chart. 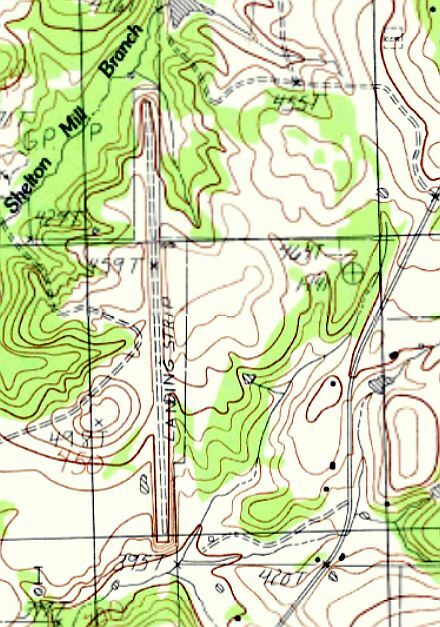 The remains of Gaskin Field were not depicted at all on recent USGS topo maps. but the outlines of the 2 runways were still clearly recognizable, along with a connecting taxiway at the south end. The outline of a ramp area to the west of the runways was also perceptible. Ross Richardson said in 2003, "I came across Gaskin quite by accident. 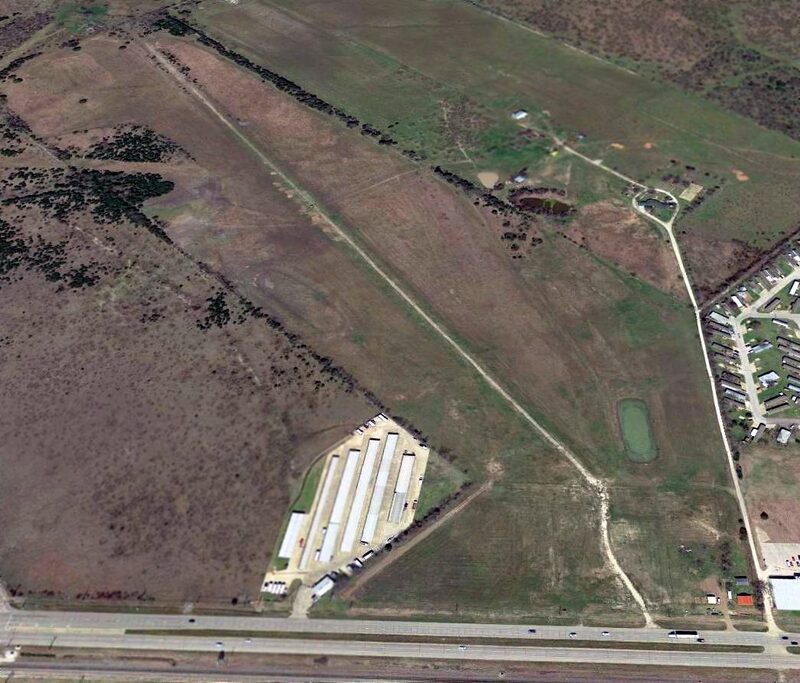 I was flying from Sherman to Denton & flew over this pasture that sure looked like the photo you provide in your website. I talked to some long-time pilots in the area & they confirmed that it was a AAF field. I wonder if it could be refurbished into a residential airpark. Hmmmm." Bo Boggs reported in 2003, "I have been observing it for 4 years & each year it becomes less distinct." Southwest Airlines pilot Will Ware reported that Gaskin Field was still recognizable from the air, as of 2007. A 2014 aerial view looking north at the remains of Gaskin Field, showing the outline still barely recognizable of the 2 runways & the connecting taxiway.